By integrating Office365 with WakaTime, the time you spend coding on each commit is posted to your Office365 Group Conversations. Open a file from a GitHub project in your editor and save a change to that file. This will create coding activity under a new project on WakaTime.com. Go to https://wakatime.com/projects and click the "commits" link next to that project. This will ask you to connect that WakaTime project to the corresponding GitHub repo. Go to https://wakatime.com/integrations and click the "Add" button for Office 365. Choose the Office Group you want to connect to. Choose the GitHub repo from the dropdown and click "Save Integration". That's it! 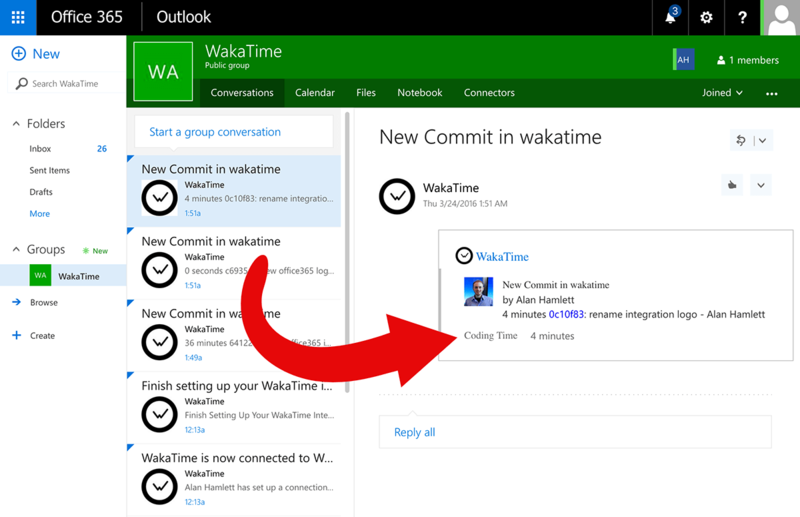 Now you should see a notification posted to your Office 365 Group with the commit message "test waka integration" and including the time you spent coding on that commit. More info with screen shots can be found in this blog post.